Full of beautiful color and evocativeness, this tapestry "The Night Before" shows the work of Thomas Kinkade. 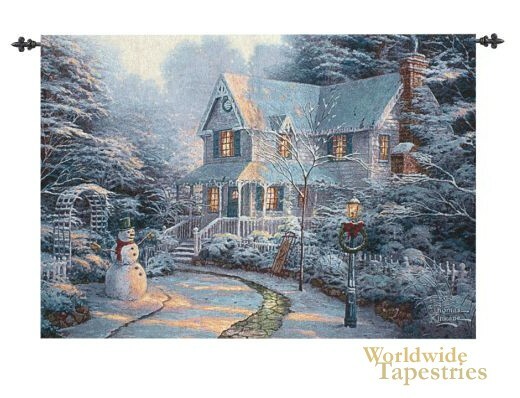 Thomas Kinkade (1598-2012) known as "Painter of Light" grew up in California who subsequently lived in New York, where he created "The Artist's Guide to Sketching". Focusing on beautiful American countrysides, we see here an example of this passion of his. Here we see a gorgeous inter scene of a home in the snow, with intricate details of snow on the trees, plants, house and trellis, including a snowman in the garden. The use of light is clever in this work as we see hints of golden beams of light lighting up the path to the home, as well as the same light striking the side of the home itself. This landscape art tapestry "The Night Before" is backed with a lining and has a tunnel for easy hanging. Note: Tapestry rods, where pictured, are not included in the price.